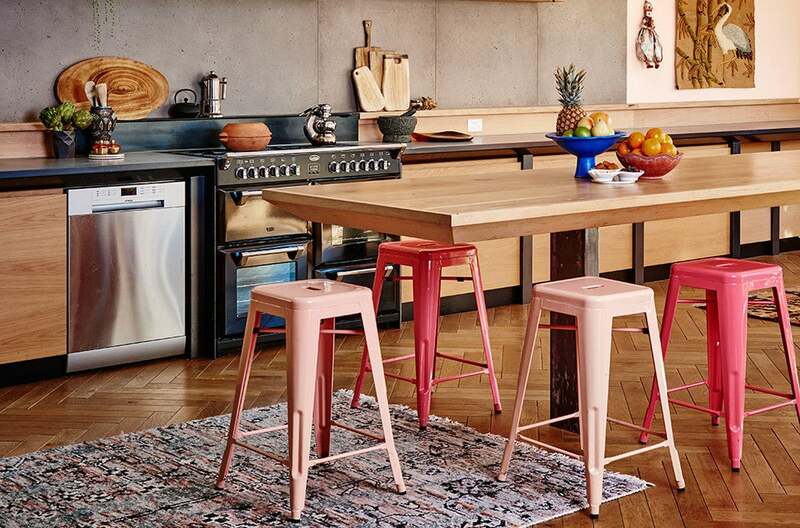 Further proof that Australian interiors continue to dominate the trends. Situated on the Bellarine Peninsula, off Australia’s Victorian Coast, Kip&Co cofounder Hayley Pannekoecke and husband James, built and designed the home of their dreams. Frankly speaking, it’s actually also the home of our dreams. The couple share the 3,980 sq ft home with their children Chloe, Faye, and Floyd, as well as their two dogs Jaffa and Cookie. The space boasts no shortage of unexpected color pairings, one seriously Pinterest-perfect attic loft, and an outdoor pool that epitomizes modern elegance. We caught up with Pannekoecke to get the lowdown on her flawless sense of style and knack for seamlessly integrating a dynamic palette within a curated aesthetic. Built in 2016, the house features hardwood timbers, American oak parquetry floors, New Zealand wool carpets, a concrete stucco rendering on the outside areas, a spacious attic loft, and an outdoor pool. What is the main inspiration behind the decor? I have an eclectic, uncomplicated style and enjoy mixing materials, colour, and texture to create an interesting and homely feel. I love Moroccan and European design, including Scandinavian. We don’t like to follow trends and choose things we really love and then mix them together. A lot of our pieces are either vintage or collected on travels abroad. The design we developed together, as we drew on past building experiences, but our style doesn’t change much and we are mostly inspired by European architecture. What is your favorite spot in the home, and why? My favorite spot is fireside on a Friday night: we’ll have our double-sided open fire going and I’ll be seated on one of my favorite armchairs with the kids— it’s a great place to be. What was your trick to seamlessly integrating such a wide range of colors into each of the rooms, while also managing to keep the overall aesthetic of the home on a consistent level? I get tired of white walls and always feel like coloured walls make decorating easier— as the room is already spoken for, in a way. My decorating style is a bit of an eclectic jumble so I like mixing it up anyway. I love Scandinavian vibes but also the energy of Moroccan and African interiors. I wanted to create a space that had a calm feminine energy so I chose shades of pink for the walls in our kitchen area and our bathrooms. It was a bit of an experiment with colour, to be honest, but I love the result. Let’s talk about that kitchen—is that a concrete backsplash we spot? The kitchen is really large and the heartbeat of our home. We spend a lot of time here. It is filled with natural light including a giant sky light that runs the length of the kitchen. We wanted a space with multiple dining options for our family and friends to dine with us. We used a lot of concrete throughout the home, James is the designer and makers of all. We love concrete and the way it feels so surprisingly warm and yet industrial when used amongst timber. We love the way it is forever changing and takes on the occasional stain or mark overtime with its porous nature. At the other end of the kitchen is the butlers pantry which also doubles as the laundry. I call this the engine room of the house, it’s where I get things done! I designed it this way as I wanted to be able to cook dinner and throw in a load of laundry, and help the kids with their homework at the kitchen bench while, also folding washing and unpacking the dishwasher. A shade of periwinkle stuns in one of the three baths of the home. Matching tiles complete the look. Describe the attic space and the thought that went into designing it. The light in there is seriously inspiring! The Loft—unlike the rest of the home—is entirely white and a blank canvas. We have a lot of family and friends in Melbourne a (1.5 hour drive) and we wanted to have a space they could stay in when they came down. It’s too far to drive home after a long lunch and a few bottles of red wine! I wanted it all white as a really lovely contrast to the rest of the home. The round windows that look out toward the sea create a lovely feel and are the heroes of the space. The loft is huge and I often say it’s bigger than a Parisian apartment. We eventually want to make it into a parents’ retreat with sunken lounge and bathroom. The bathroom with the floor-to-wall tile look is incredible. What inspired this design? All three bathrooms feature floor-to-ceiling tiles. I wanted this room to look like a plunge pool so, we tiled it using actual pool tiles and it feels like it goes on and on, especially with the mirrors. It was a great colour choice for the boys in our home and they love it. If you could change or redo one thing, what would it be? I would have made the house smaller!